Creative Ardagh: What's new in Creative Ardagh? Primary School Tours - this was the best TOUR EVER!!!! That is a quote from the children who attended Ardagh Heritage and Creativity Centre on school tours during the months of May and Jue 2013. Children of all primary school ages had fun and explored their creative side with us in Creative Ardagh during 2012/2013. Creative Ardagh is ideal for educational tours at any time of the year with great indoor and outdoor facilities. We can adapt the visit to suit the class level and the area in the curriculum you are most interested in exploring including SESE (science, history and geography), SPHE, English or Irish, Drama and all strands of the Visual Arts and we provide lesson plans!! 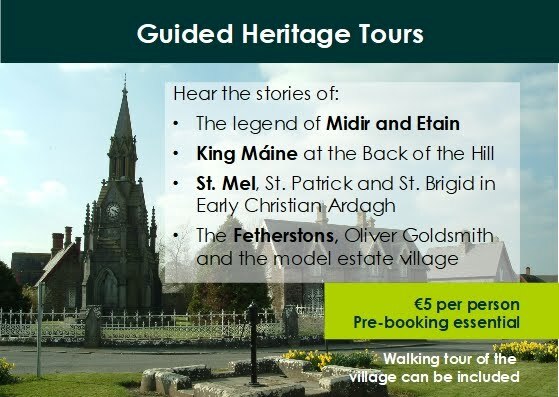 Programmes can be tailored to the groups' needs with topic options including (but not limited to) myths and legends; feasts and festivals; early Christian Ireland; life in the 18th and 19th centuries; designing a village; games from the past; continuity and change; literature, arts, crafts and culture; caring for my locality; plants and animals; making and using maps etc. We base our creative classes on the vast heritage and history of our area using all kinds of media such as drawing, painting, clay, printing etc. €5 per person per hour for groups of less than 10,€4 per person per hour for groups greater than 10. We offer a diverse range of programmes for secondary school group visits building on years of teaching experience in Art, English and History. Drawing from primary sources is central to the Art, Craft and Design syllabus at Junior and Leaving Cert level. Ardagh Heritage and Creativity Centre houses a unique collection of objects which can be used as inspiration for a range of craft and design work. We can also design programmes based on the local area for other subjects including History, Geography, Science, Home Economics, Technology, Construction etc. Interactive, cross-curricular visits can be organised for TY and LCA groups, and traditional Leaving Cert art history, appreciation or craft workshops are also a possibility. We have had visits from Science/Domestic Science/ Religion classes to name a few. Contact us for more details to discuss your specific requirements. €5 per person per hour for groups of less than 10, €4 per person per hour for groups greater than 10. 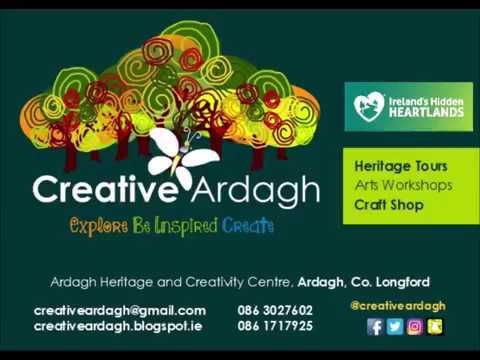 Creative Ardagh is ideal for this age group as we encourage exploration in various media such as painting/printing/clay/drawing/play/dress-up to name a few. You can have a fairy hunt/dinosaur hunt/treasure hunt in the woods or if the weather is not suiting the building is large and magical and encourages children to use their imagination. At Creative Ardagh we offer a chance to pursue your own creative journey in a relaxed environment surrounded by local history and natural heritage. Providing inspiration and guidance, without prescriptive step-by-step instructions, we will offer courses in a range of arts and craft media from drawing, painting and printing to felting, weaving and embroidery and lots in between. We are open for drop-in art and crafts for adults or children every Thursday from 11am to 2pm or available to cater for groups of all ages when pre-booked. Call Annette on (086) 3027602 or email creativeardagh@gmail.com to arrange your group class. Drop-in Thursdays per person : €5 per hour without tuition, €7.50 per hour with tuition. All materials and tea/coffee are provided. Groups per person: €5 per hour for groups less than 10, €4 per hour for groups over 10. Tuition, all materials and tea/coffee are provided.. If there is a specific craft you are interested in learning or improving please email and let us know and we will do our best to provide a course in the future subject to demand. Portfolio Course runs on every second Tuesday evenings 7.00 to 9.30pm from 10th September, €20 per class. The Ardagh Heritage and Creativity Centre collection and the village itself provide a wealth of inspirational material suitable for weekly or short intensive portfolio courses in a wide range of media. With the expert guidance of an experienced art teacher, who has mentored many students on their way to third level courses, portfolios can be completed for general art and design courses or developed for the specific requirements of the NCAD brief or other specialised areas such as animation. Students will be encouraged to develop their own interests, coming up with creative ways of self-expression, while also preparing for the realities of life as an art student. The course will cover all aspects of portfolio preparation from creating sketchbooks to finished pieces (please note that for the NCAD brief the emphasis is on developing worksheets rather than highly polished finished work). Limited places to ensure individual attention, book by email to creativeardagh@gmail.com or ring Annette on (086) 3027602 to fiind out more. Our very successful Toddler Creativity Morning continues on Thursdays from 11am to 12pm, €5 per child with a free coffee/tea for the accompanying adult. Sensory arts experiences for the very young play a vital role in early development. We provide a safe space for parents and children to interact and learn through art. The gardens and woods surrounding the centre offer a stimulating environment for exploration at all times of the year and some interesting toddler art has grown out of this!!. Christmas - Keep an eye on the website for Christmas plans. Creative Ardagh provide the best value, hassle-free and fun-filled Christmas Event every Christmas. In year 1 we met the Grinch who stole Christmas, he chased Santa for his presents but when we sang around the tree he found his heart again and helped us in our Art Workshop. A magical experience was had by all who attended and each child had a visit with Santa with no queuing!! Why queue when you can draw and cut and paste and make and do!!. In year 2 we went to Storyland and explored the building finding characters and places from all our favourite stories. We made more Christmas Crafts and ended up visiting Santa through the wardrobe of Narnia. We continued with our no queuing policy and everyone had a relaxing happy time. Year 3 theme has not been decided as yet but we guarantee it will be as fun-filled, hassle-free, queuing free and craft-making filled as the years before so book early. Keep an eye on the website for details. We have noticed that the mothers and fathers enjoy the arts and crafts as well - maybe an adult party would be something you would consider ? Spanish Grind Club for the Leaving Cert Cycle is starting classes on Friday 4th Oct, 6.30 to 8pm. €70 for 6 weeks with an extra €5 towards materials payable on the 4th. If paid weekly it is €15 per week with a once off €5 for materials on the first week. Oral, aural and written papers are covered. This was a very successful club last year and the students benefited greatly in their confidence in the language and also in their grades. If enough Junior Cycle students are interested a club will be set up for them too. Are you interested in german for children classes ? We have a tutor ready if the numbers are sufficient. Are you interested in Chinese on a Wednesday evening? We have a tutor ready if the numbers are sufficient. Are you interested in Jewelery making? We have a tutor ready if the numbers are sufficient. Each student will leave with their own personally made piece.